A great Christmas gift. This is a beautiful collection of acoustic winter tunes from folk singer/arranger/multi-instrumentalist. MaryLee is an award-winning entertainer and lifelong traveling troubadour! Singing in a sparkling clear, and melodious folk-style from her Celtic heritage, MaryLee accompanies herself on acoustic guitar, lap harp, mandolin and a wild gypsy-style tambourine. She performs concerts of traditional and original songs and amusing tales from her life on the road. 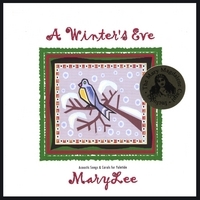 MaryLee is the producer/writer/performer of 14 CD’s of traditional and original music. Her credits include touring America for nine years as a member of “Randy Sparks & The Back Porch Majority,” recording the title song to Walt Disney’s Apple Dumpling Gang, singing back-up for Shirley Jones, opening act for Bill Cosby and many concert appearances with the legendary Burl Ives. She received her certificate of study in Musical Theatre from London Drama School with distinction in singing. She performs many concerts for festivals, folk clubs, and corporate and academic groups annually. She is a frequent performer at public libraries throughout California and Washington, and is a teaching artist of musical theatre for Pacific Repertory Theatre’s School of Dramatic Arts Carmel.